We’d love your help. Let us know what’s wrong with this preview of The Doctrine of Repentance by Thomas Watson. To ask other readers questions about The Doctrine of Repentance, please sign up. On the plus side of good. Listened to it again in April of 2017, and thought it improved a star, from three to four. Listened to it again in November of 2017. I am thankful to have picked this up when I did. Watson is both biblical and theological in persuading you to repent. Also, this is probably one of the most quotable books I have ever read. Here is just a taste! "Smite your soul, said Chrysostom, smite it; it will escape death by that stroke. How happy it would be if we were more deeply affected with sin, and our eyes did swim in their orb." "Repentance is pure gospel grace." "A wicked man may be troubled for scandalous sins; a real convert laments I am thankful to have picked this up when I did. Watson is both biblical and theological in persuading you to repent. Also, this is probably one of the most quotable books I have ever read. Here is just a taste! "A wicked man may be troubled for scandalous sins; a real convert laments heart-sins." "Godly sorrow, however, is chiefly for the trespass against God, so that even if there were no conscience to smite, no devil to accuse, no hell to punish, yet the soul would still be grieved because of the prejudice done to God." "We are to find as much bitterness in weeping for sin as ever we found sweetness in committing it." "A broken heart and a broken Christ do well agree. The more bitterness we taste in sin, the more sweetness we shall taste in Christ." "They who will not confess their sin as David did, that they may be pardoned, shall confess their sin as Achan did, that they may be stoned." "Confession of sin endears Christ to the soul." "Unthankfulness is a sin so great that God himself stands amazed at it: 'Hear, o Heavens, and give ear, O each: I have nourished and brought up children, and they have rebelled against me' (Isa 1:2). "Can we look upon a suffering Savior with dry eyes? Shall we not be sorry for those sins which made Christ a man of sorrow? Shall not our enormities, which drew blood from Christ, draw tears from us? Shall we sport any more with sin and so rake in Christ's wounds? Oh that by repentance we would crucify our sins afresh!" "A repenting person fears and sins not; a graceless person sins and fears not." A really good book on repentance. Uncovers all the false ways we repent, gives a picture of what true repentance looks like, as well as motivations to repent. The only drawback is one can leave feeling like they have never really repented at all. As with most Puritans, they uncover our the deceitfulness of our heart, which can leave someone feeling unsure that they are even saved. I am not sure that is such a bad thing. Carl Trueman said when he was in England he had to convince folks they reall A really good book on repentance. Uncovers all the false ways we repent, gives a picture of what true repentance looks like, as well as motivations to repent. The only drawback is one can leave feeling like they have never really repented at all. As with most Puritans, they uncover our the deceitfulness of our heart, which can leave someone feeling unsure that they are even saved. I am not sure that is such a bad thing. Carl Trueman said when he was in England he had to convince folks they really were Christians. But when he came to America he had the opposite problem. This book is an excellent antidote to the self-assured presumption of many American Christians who think they can follow Jesus without leading a life of repentance. I thought this was a very accessible book. There were times where it felt repetitive but then it also made me realize how nuanced repentance is. Also, from reading this book, I realized that what I'm being reminded today was also important back then. Thankful for the reminders and also new lenses that this book provided me. Great book on repentance that all Christians must read. I just realized that I started this book on April 15th and ended it on the same day a year later. This was totally unintentional. This book was so rich that I had to read it slowwwly. God changed my whole life in the course of reading this and I have no doubt that God used this book to bring me to where I needed to be in order to understand his grace more than ever before. This was very good. A book on repentance sounds like something hung you might want to avoid, but what treasure there is in this little book. I was convicted and also sharpened to better understand repentance and how I might go about doing that before my God and King. Short book and well worth your time. As soon as I finish a book by a Puritan writer, I always want to go back and re-read it right away. They are so full of rich doctrine and practical application that I know I will get more out of it the second time. Livro maravilhoso! Com certeza irá mudar seu pensamento sobre arrependimento! Great. Will refer back anytime I need counsel on repenting. Thorough, discouraging, heart-warming, Puritan. There were a lot of good things in this book, and I know it's a classic so who am I to criticize and all that. But I really struggled to get past the fact that Watson teaches that you ought to try and feel as bad as possible for good repentance, and I just think that's crazy. Your repentance isn't going to be more effective if you beat yourself up more, because that's you interacting with you, and repentance is an act between you and God. Good repentance is when the Holy Spirit brings conviction There were a lot of good things in this book, and I know it's a classic so who am I to criticize and all that. But I really struggled to get past the fact that Watson teaches that you ought to try and feel as bad as possible for good repentance, and I just think that's crazy. Your repentance isn't going to be more effective if you beat yourself up more, because that's you interacting with you, and repentance is an act between you and God. Good repentance is when the Holy Spirit brings conviction to us, and our feelings are a response to his conviction, and not to our own attempts at self-denigration. Plus, the intensity of your emotion is in general a really bad measure for spiritual progress. "How happy it would be if we were more deeply affected with sin..."
This book does just that. It deeply affects the reader with their sins. Showing them the bitterness of sin compared to the sweetness of the blood of Christ that can be had for all who would repent. Once I started reading, I could not put the book down. Written so simply yet so profoundly! I found myself underlining, marking, and meditating on the quips, quotes, and Scriptures woven together by this Puritan work of nearly 350 years ago. I recommend this small book for any minister of the Gospel as well as any person wanting to learn more of the doctrine of repentance found in the Word of God. Having my heart stirred, I will be recommending this book to many of my friends! Here are a few line Once I started reading, I could not put the book down. Written so simply yet so profoundly! I found myself underlining, marking, and meditating on the quips, quotes, and Scriptures woven together by this Puritan work of nearly 350 years ago. "Self-love raises a sickbed vow, and love of sin will prevail against it. Trust not to a passionate resolution; it is raised in a storm and will die in a calm." "Repentance is a grace of God's Spirit whereby a sinner is inwardly humbled and visibly reformed." "The eye is made both for seeing and weeping. Sin must first be seen before it can be wept for." "A woman may as well expect to have a child without pangs as one can have repentance without sorrow." "Martyrs shed blood for Christ, and penitents shed tears for sin." "Unsound hearts pretend to leave old sins, but they do not turn to God or embrace His service." "The repenting prodigal did not only leave his harlots, but he arose and went to his father." "A hard heart is a receptacle for Satan. As God has two places He dwells in, heaven and a humble heart, so the devil has two places he dwells in, hell and a hard heart. It is not falling into water that drowns, but lying in it. It is not falling into sin that damns, but lying in it without repentance." "There is no rowing to paradise except upon the stream of repenting tears." "Till sin be bitter, Christ will not be sweet." "Such as will not weep with Peter shall weep like Judas." "Indeed repentance fits us for mercy. As the plough, when it breaks up the ground, fits it for the seed, so when the heart is broken up by repentance, it is fitted for remission, but it does not merit it. God will not save us without repentance, nor yet for it. Repentance is a qualification, not a cause." "We please God by repentance but we do not satisfy Him by it. To trust to our repentance is to make it a saviour. Though repentance helps to purge out the filth of sin, yet it is Christ's blood that washes away the guilt of sin. Therefore, do not idolize repentance." "The farm and the shop so take up people's time that they have no leisure for their souls. Their golden weights hinder their silver tears." "Every step forward in sin is a step backward from God." Never have I underlined a book so much! In fact, I underlined every page but 3! As my first puritan read, I was not at all intimidated by the language/translation. The book is only 60 pages, but it's condensed with much wisdom, scripture, and theology. I highly recommend this for anyone who knows they have unrepentant sin or addiction. This short read took me a month or two to finish due to all the notetaking and chewing. I could hardly make it a page or two before stopping to think. I could not Never have I underlined a book so much! In fact, I underlined every page but 3! As my first puritan read, I was not at all intimidated by the language/translation. The book is only 60 pages, but it's condensed with much wisdom, scripture, and theology. I highly recommend this for anyone who knows they have unrepentant sin or addiction. This short read took me a month or two to finish due to all the notetaking and chewing. I could hardly make it a page or two before stopping to think. I could not believe there was so much to know about a small doctrine like this! I learned a lot and this book has greatly affected me and the way I look at my repentance. 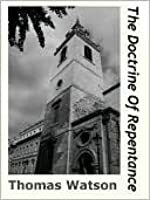 This is a wonderfully helpful treatise on a subject that is the central to the Christian life, repentance. Watson addresses the need for repentance, the marks of counterfeit repentance, the nature of true repentance, etc. the most helpful portion of the book though is the final two chapters in which he highlights the means to repentance. Throughout, the book is filled with colorful metaphors and delightful turns of phrase. An easy and helpful introduction to Puritan writing. And a profitable rea This is a wonderfully helpful treatise on a subject that is the central to the Christian life, repentance. Watson addresses the need for repentance, the marks of counterfeit repentance, the nature of true repentance, etc. the most helpful portion of the book though is the final two chapters in which he highlights the means to repentance. There are few books that I’ve read as theologically rich and immensely practical as this one. This is a book I plan on returning to read many, many times. Don’t let the old English language scare you. It can be difficult, but you may find it surprisingly readable if you move slowly and patiently through it (some might even say “virtuously”). Thankfully Watson’s chapter lengths are usually only a few pages each, making it extremely conducive to reading at a slower pace over multiple days and taki There are few books that I’ve read as theologically rich and immensely practical as this one. This is a book I plan on returning to read many, many times. A thorough work on what it means to repent. This is my second time reading through it, and I remembered why it had such a lasting influence on me when I first came to Reformed convictions. Watson is a master exegete of the Bible, and clearly expounds on the words of Jesus in Mark 1:15. He goes into what true repentance is, and how central it is in the life of the Christian, and also goes into warnings for the impenitent. A very sobering work, but very balanced biblically. If you’re alive, then this is a skill you need to develop and this book, though short, covers the topic extensively. By the end, you’ll probably realize you have never sufficiently repented of anything. Thinking through the topic at the level this book demands will help you in every context of your life where you interact with people or God. So yeah, all the contexts. I am never disappointed with Puritan Paperbacks. These books are full of richness in Christ's word, helping the reader fall more in love with God with each word and passage. I have really enjoyed reading from the various puritan writers, and falling in love with God and His Word through their rich writing. This was an amazing little book which really delved into exactly what repentance of sin actually is. It is chocked full of amazing nuggets of wisdom on nearly every page, and you will find yourself extremely grateful that you picked this book up if you're a Christian. amazing book..there are things i never thought of and really good instruction....i am always amazed by the amount of thought and wisdom contained by people of a past era. we assume ourselves wiser but underestimate puritans. A much needed reminder for Christians and heathen alike. Without Christ there would be no repentance. Thank the Lord for His abundant mercies. Thomas Watson (c. 1620—1686) was an English, non-conformist, Puritan preacher and author. He was educated at Emmanuel College, Cambridge, where he was noted for remarkably intense study. In 1646 he commenced a sixteen year pastorate at St. Stephen's, Walbrook. He showed strong Presbyterian views during the civi Librarian Note: There is more than one author in the Goodreads database with this name. Thomas Watson (c. 1620—1686) was an English, non-conformist, Puritan preacher and author. He was educated at Emmanuel College, Cambridge, where he was noted for remarkably intense study. In 1646 he commenced a sixteen year pastorate at St. Stephen's, Walbrook. He showed strong Presbyterian views during the civil war, with, however, an attachment to the king, and in 1651 he was imprisoned briefly with some other ministers for his share in Christopher Love's plot to recall Charles II of England. He was released on 30 June 1652, and was formally reinstated as vicar of St. Stephen's Walbrook. He obtained great fame and popularity as a preacher until the Restoration, when he was ejected for nonconformity. Not withstanding the rigor of the acts against dissenters, Watson continued to exercise his ministry privately as he found opportunity. Upon the Declaration of Indulgence in 1672 he obtained a license to preach at the great hall in Crosby House. After preaching there for several years, his health gave way, and he retired to Barnston, Essex, where he died suddenly while praying in secret. He was buried on 28 July 1686.